The importance of “feeder veins” in the study and treatment of spider veins (telangiectasias) of the leg is well established. “Feeder veins” are a type of reticular veins, which are plentiful throughout the legs, forming a reticular network beneath the skin surface, hence the name RETICULAR. Most reticular veins have no relationship to spider veins, but when these veins are connected and supply the spider veins, they are called FEEDER veins. When visible to the naked eye, they appear as blue or greenish veins that are bigger than spider veins. Whereas spider veins appear to be on the skin surface and are small with clearly defined edges, feeder veins appear larger, pale blue or green with poorly defined edges and are clearly not on the surface. Thus an appropriate definition of feeder veins would be the following: FEEDER VEINS are reticular veins that course beneath the skin surface and join surface spider vein clusters and result in regional increased venous pressure that cause and supply spider veins (telangiectasias). It may be that many of these feeder veins have malfunctioning venous valves causing the increased venous pressure. Some patients have reticular veins so prominent that they appear enlarged and bulge on the skin, but in most patients the feeder veins supplying spider vein clusters are not visible to the naked eye. At Dallas Vein Specialists we also treat the unsightly enlarged and bulging reticular veins, but that is another subject we will discuss in a separate blog. Suffice it to say that these prominent reticular veins are often a cosmetic problem and can even cause symptoms such as aching or burning. Photo of spider veins (telangiectasias) of leg and augmented reality showing feeder veins. One may already surmise that if feeder veins join and “supply” spider veins, it is important to combine treatment of the feeder veins with the spider vein treatment. If the spider veins are treated without treating the associated feeder veins, the result will likely be suboptimal. The usual result is poor clearing of the spider veins, or if they initially disappear, they will often reappear after an interval of time. I find that following the above protocol yields the best results. There are different ways of detecting feeder veins, which typically cannot be seen without some technical advantage. 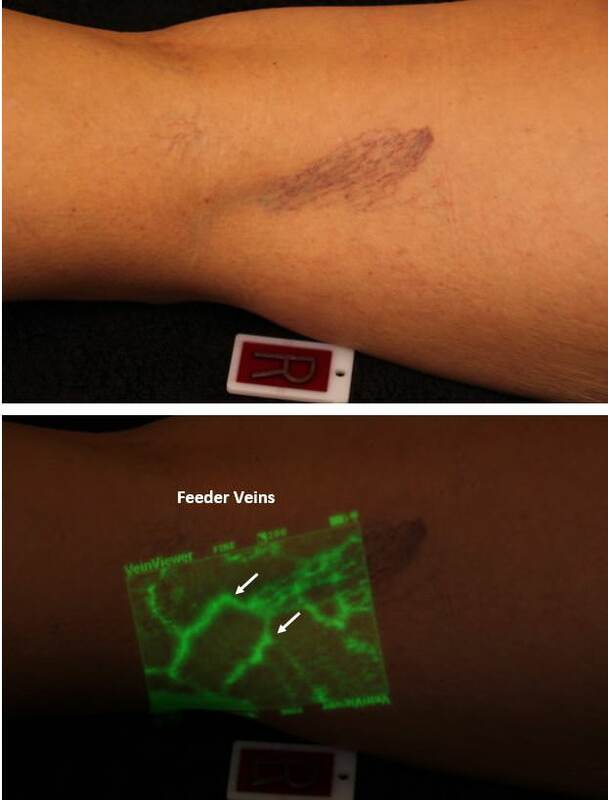 The use of a transilluminating light on the skin may sometimes show feeder veins, but I have found that using augmented reality clearly demonstrates them. The device I routinely use is the VeinViewer. This augmented reality device can detect veins of varying sizes up to several millimeters below the skin surface and then project a clear image of the veins in real time back onto the skin. 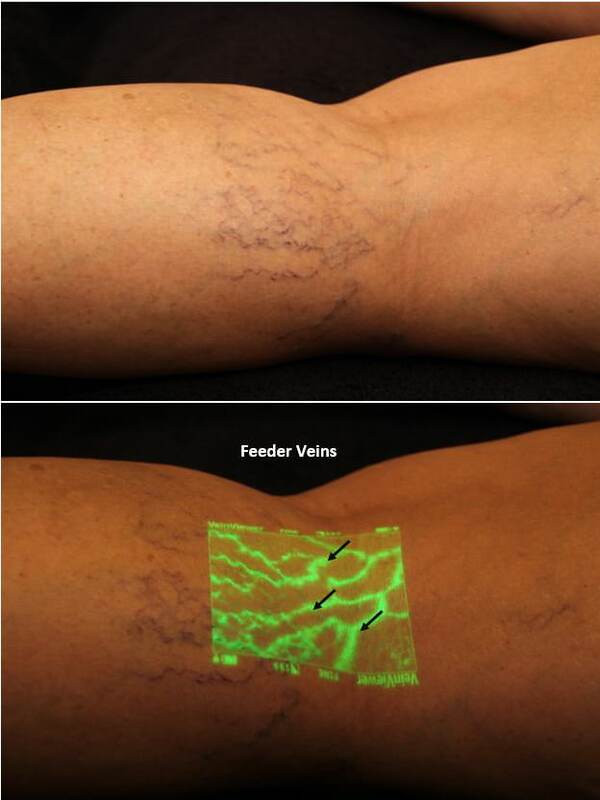 It can detect feeder veins that are often missed with transillumination light devices. Our VeinViewer has become invaluable as a treatment aid. At Dallas Vein Specialists, spider veins, and if present, feeder veins, are treated with the CLaCS (CryoLaser CryoSclerothearpy) technique. The CLaCs is a combination of transdermal laser and sclerotherapy directed to both spider and feeder veins. We have been using this remarkable treatment regimen for the past three years. Our success far exceeds what we were achieving with sclerotherapy alone. Patients have been pleased with the results of the combined feeder vein — spider vein CLaCS treatment, and spider vein recurrences have been much reduced. The best aesthetic and long-lasting results are achieved when feeder veins are treated in conjunction with spider veins. I invite you to review the CLaCS treatment at dallasveinspecialists.com. Look for CLaCS under VEIN TREATMENT or look at SPIDER VEINS for more in-depth descriptions of this remarkable procedure. Also, check out the BEFORE AND AFTER GALLERY photographs of CLaCS results.